Inside a nuclear reactor, long-term exposure to the radiation of energetic particles damages the reactor components, e.g., plasma facing materials and structural materials. Nano-structured metals (NMs) have been demonstrated to be radiation tolerant experimentally. This is attributed to the complex across-scale interaction of radiation-created defects, e.g. 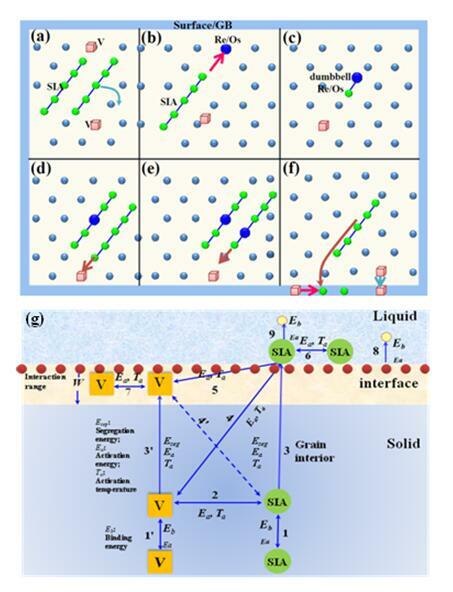 interstitials (SIAs) and vacancies (Vs) with the grain boundary (GB) and surface in nano-structured metals. To understand the defect-GB/surface interaction processes and reveal the across-scale self-healing mechanism in NMs, a nuclear material study team led by LIU Changsong and FANG Qianfeng in Institute of Solid State Physics, Hefei Institutes of Physical Science, collaborating with researchers from Institute of Plasma Physics, Hefei Institutes of Physical Science and researchers from Institute of Modern Physics, developed two sets of software to investigate radiation effects in NMs (the software copyright registration numbers: 2018SR037598, 2018SR085000). Using the software, the team simulated the SIA-emission induced annihilation in several NMs. NMs have been explored as self-healing materials for radiation damage due to V-SIA recombination at interfaces, such as GBs in nanocrystals (NCs) and free surfaces in nanoporous metals (NPs). The annihilation in copper (Cu) was recently proposed to be via the interstitial-emission (IE) from the GB. However, the SIA is often considered to overcome a large binding energy with the GB/surface to migrate out of the GB/surface and induce annihilation. Whether the IE is applied as a possibly universal mechanism in other NPs and NCs deserves further investigation. Researchers found that the SIA only needed to migrate over a small distance from the GB/surface to recombine with the V nearby at a small energy barrier. During the process, the annihilation region around a static SIA at the GB/surface propagated or extended greatly to the adjacent bulk area (Fig. 2). The annihilation was found to be via the IE from the GB/surface or coupled V-hop with the IE. The ratio of the SIA-GB/surface binding energy to the trapping-radius of the GB/surface for the SIA was proposed to be a better qualitative indicator for the difficulty in the IE than the binding energy (Fig. 3). These results suggest that both the surface and GB play an efficient role in improving radiation-tolerance of NMs. The IE mechanism may work universally in various NMs. 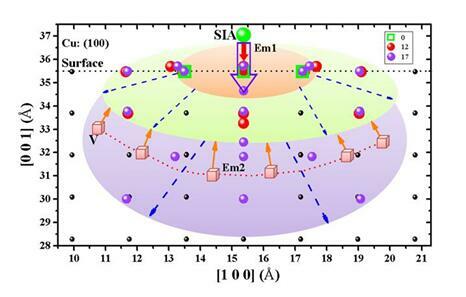 This work was supported by the National Magnetic Confinement Fusion Program, the National Key Research and Development Program of China, the National Natural Science Foundation of China, and by the Center for Computation Science, Hefei Institutes of Physical Sciences. This research project was part of the CRP (Co-ordinated Research Projects) program carried out under the sponsorship of the International Atomic Energy Agency (IAEA). 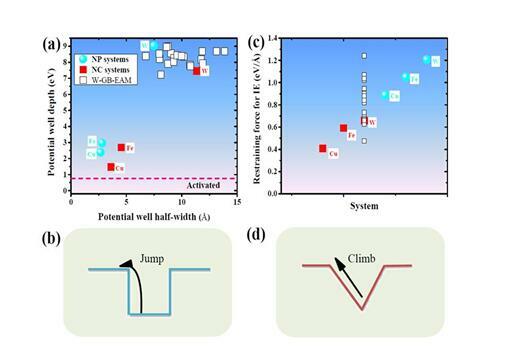 The present work was published on Journal of Nuclear Materials (2018, 500, 199-212) entitled “On the possibility of universal interstitial emission induced annihilation in metallic nanostructures”.